We have spoken at length here regarding the evolution of brands and how new age retail requires the 3 legs of a stool (in no particular order): 1) wholesale; 2) etail or DTC; 3) retail. I was reminded of this need as I reviewed Merkle's latest Digital Marketing Report outlining a cost per click on Google up 10-12% year over year and CPM on Facebook up 70%. Buying eyeballs and clicks sure ain't cheap. Brands that start in wholesale eventually crave the high margins of etail. Once the brand acquires the captive loyal brand aware customers, they start to desire the allure of a store and justify the new expense as a new channel and marketing awareness vehicle. Key example is Canada Goose. Brands that start in etail or DTC aggressively purchase ads via Google, Facebook (Instagram) and justify any acquisition through lifetime value as a customer. Once the growth slows, the brand will focus on wholesale opportunities that provide large orders they can typically buy and sell "hand to mouth." Key example is Casper or Harry's. Unless you are a private company with investors not requiring growth, you must have 2 of the 3. This need will only compound as the cost of acquiring customers becomes more expensive with duopolies controlling the largest ecommerce markets. There is nothing like the World Cup. A coming together of 32 countries every 4 years. To get into the spirit, I recently finished Red Card: How the U.S. Blew the Whistle on the World's Biggest Sports Scandal. Over the last decade, hundreds of millions of dollars determined host cities of various Cups and qualifying teams through an elaborate system of bribes and kickbacks. Many believe that this World Cup would suffer due what was exposed. While ratings are down, I believe very few care or even recall what the guilty parties were convicted of. A number of the majors have been eliminated. Germany, Spain and Argentina are all already out. Italy and the US didn't even make the qualified teams. Even with some of the favorites out of contention and the fraud overhang, I can't help but be excited for each of the knockout stage games. Online Sales Taxes: Winners, Losers & Does It Matter? As we have all heard, the US Supreme Court ruled on Thursday that all states can collect sales tax for any online purchases. While this will take years to play out as states decide the amount to tax, what to tax (inbound transactions, outbound distribution) and who to tax (in-state, out of state), there are some clear winners and losers. States: Most state and local budgets desperately need the money. Tax Service Providers: Avalara (nice IPO timing), Taxjar, H&R Block and other service providers. This will complicate tax collection and remittance for businesses of all sizes. The sheer number of jurisdictions is in the thousands. Amazon: The behemoth already collects where required for 48% of their business and this will force their 52% of their 3rd party sellers to start collecting. Amazon charges a fee to sellers they collect on behalf of. Amazon Small and Medium Size Sellers: Most Amazon 3rd party sellers don't collect. Once they start, Amazon will charge a fee and the sellers will add the cost and labor burden of collecting and remitting. Wayfair, Ebay, Etsy and Other Smaller Marketplaces: Most sellers on these platforms and the marketplaces themselves do not collect unless they are larger businesses. Consumers: Eventually the cost purchasing goods will be higher on almost all purchases. Time - This change won't happen overnight as states grapple with the best way of implementing, communicating and policing the new requirements. Sales Taxes are Hidden - Collection and recognition of taxes happens at the checkout and isn't stated upfront in the cost of the product, most customers are already captive or convinced of the purchase. Convenience - What drove most customers to online isn't changing. Online purchasing will still remain incredibly convenient and convenience is the number one attraction to ecommerce. I agree. For a number of reasons. But before going there, we need to address the stigmas of private label. Private label brands have been on the retail scene for decades. There will always be a customer willing to purchase a lower cost brand and not fall victim to marketing. All multi-brand retailers give private labels a shot. Depending upon the category, private label sales can account for up to 40% of the overall category sales. So why is Amazon any different for releasing private label product? Some may argue because they can take the first search result spot. Is that any different than Target providing an end cap in the most important aisle in their stores? Brands pay for that spot. Just like they do on Amazon. I'd even argue that setting up a private label on Amazon is harder than in-store. Why? Imagine the long tail of brands and products on a marketplace like Amazon versus a store shelf that may have several brands. Gaining scale is much more difficult. Another argument I hear about Amazon is they will steal your sales data to release their own private label. Is that true? Yes. But is that any different from selling a brand to Macy's, Kohls, Target or Walmart? Nope. Focus on private label or branded merchandise often depends on the type, size or financial state of a retailer. Retailers short on top brands looking for margin improvement might emphasize private label whereas retailers with a strong portfolio of brands may push private label aside. So has Amazon completely cracked private label? No. The process takes time and refining. We will see this play out for as long as Amazon keeps selling product. Private label is here to stay and always will be. Recently finished Bad Blood, the story of Theranos. I had seen the 60 Minutes on Theranos, followed along in the Wall Street Journal and felt as though I understood the level of fraud. I was incredibly wrong. This impeccably researched story has a level of deception that is shocking. What began as a vision and then turned into an over promised device eventually led to fraudulent and misleading results that impacted lives. The book is a quick read or listen as I just couldn’t put it down. All the villains, duped investors and whistleblowing heroes are covered in extreme yet convincing detail. Retailers ranging from Safeway to Walgreens believed Theranos would drive their next decade of growth and separation from the likes of Kroger and CVS. Investors ranging from Rupert Murdoch and Carlos Slim lost millions on the fear of missing out on the next Steve Jobs. The current state of private company valuations and Facebook, Amazon, Netflix, Google excitement reminds me to look past the smoke and mirrors of any pitch, marketing campaign or investor book. Sometimes things truly aren’t as good as they may seem. I highly encourage anyone to have a read...or at least a listen to Bad Blood. Each quarter I update a chart detailing their comp sales increases/decreases to better understand where the pockets of growth are coming from and who is gaining share. The latest quarter saw some increases from the struggling Department Stores sector. Note that the optimism for several retailers including Kohl's and Macy's comes as a result of pulling marketing events into the first quarter. The gains would have been marginally higher otherwise. Off Price retailers like Ross, Burlington and TJ Maxx continue to shine and have yet to reach the saturation point everyone fears and seem to be fending off Amazon for now. With the shrink in department stores, that spend has to go somewhere. I would expect this trend to continue. The Warehouse Club retailers like Costco and Sam's Club continue to do well as well. Costco has been especially strong in sales along with a strong membership base. I would also expect this trend to continue. Although Moody's contends Retail isn't having a decline comparable to that of Manufacturing, the numbers show Retail becoming less impactful on the overall economy and all strength is due to ecommerce. Mortgage rates spiked in a big way today, bringing some lenders to the highest levels in nearly 7 years (you'd need to go back to July 2011 to see worse). That heavy-hitting headline is largely due to the fact that rates were already fairly close to 7-year highs, although today did cover quite a bit more distance than other recent "bad days." I am surprised to see the limited coverage of Amazon's recent shutdown of Google Shopping/PLA (picture ads) that show at the top of Google results related to products has been. Most brands and retailers have become accustomed to Amazon typically outbidding them for position #1 in PLAs or at least being in the top 5. Alongside Amazon you will see other retailers battling it out along with the brand for placement. All of this competition leads to higher prices for better placement which ultimately helps Google. 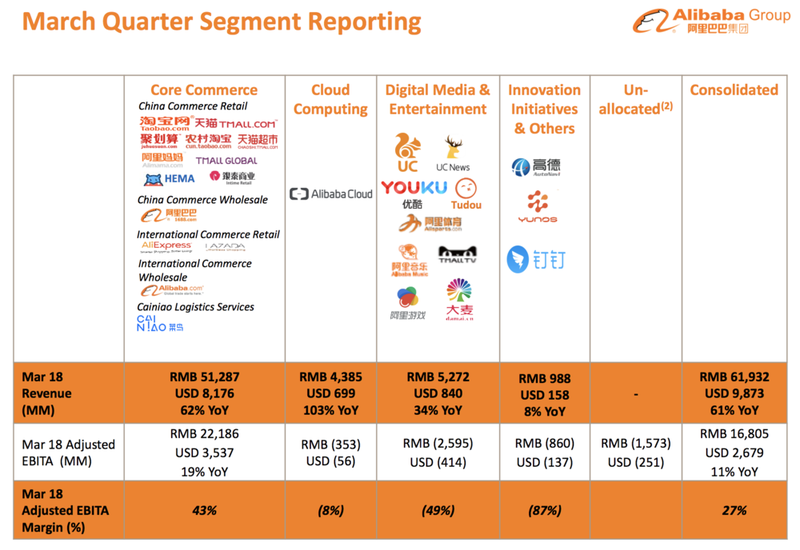 I'd be surprised if Amazon wasn't the largest bidder on the PLA/Shopping platform and with Amazon dropping out, I'd expect bid prices to come down. Could they have dropped out because they know most customers (60%+) will start their search at Amazon anyways? Could they have dropped out because the cost of PLA (imaged ads) has become too high yet continued to pay for AdWords (text ads)? Sign of the war intensifying? Likely a mix but this is definitely a good thing for those with PLA budgets and not a good thing for Google. You don't typically see CEO's concede on their ability to compete with other industry players yet the outspoken Eddie Lampert of Sears has done just that. Lampert is not your conventional CEO. Lampert comes from a hedge fund & finance background and has carried out one of the largest real estate wind downs by selling off the low and medium tier Sears/K-Mart stores and spinning the higher tier into a REIT via Seritage Properties. No retailer has been able to compete thus far. Just think about the recent headlines. Walmart sold their Asda stake to pay for their battle with Amazon in India. Bonton is now bankrupt. Some retailers realize the impact of Amazon and its reach within retail and outside of retail. Kohl's accepts Amazon returns that have led to positive traffic gains to those specific stores and a completely new customer profile. Chicos understands that 60%+ of the ecommerce growth is via Amazon and decides to list their product. Best Buy understands the importance of their private label and thus uses Alexa as their platform. Regardless of Lampert's end goal with Sears/K-Mart, his brashness is spot on. No retailer can take Amazon head on and every retailer needs to carve their niche exploiting Amazon. L2 recently interviewed author Derek Thompon on the debate of whether the distribution network and scale of Netflix is more valuable than treasure trove of content (Pixar, Star Wars, Marvel) that Disney owns. Fascinating listen on who will win over time and whether new entrants like Spotify have a chance. But is there only room for one? I find it funny how we all talk about cord cutting because of our desire to stop paying for too many channels or content we don’t need yet switch to buying “channels” like Netflix, Hulu, HBO Go, Showtime Anytime, ESPN+ with an abundance of content we don’t watch. Bundles of these apps and services have begin with Hulu and Spotify being offered together and Google TV is now the equivalent of a Verizon FiOS or Time Warner cable bundle..
Because we are just recreating the same ecosystem we are fleeing, there won’t just be one. There will be many. And companies like Disney realize this. Hence they are “confusing” customers by splitting Hulu and Disney core content into two “channels.” Why? Because adults will pay for both. They will purchase Disney streaming for the family and Hulu streaming for when the kids go to bed. Don’t count Bob Eiger and Disney out just yet, there are many more channels to come as traditional media brings their content back online. Have a listen, fascinating. 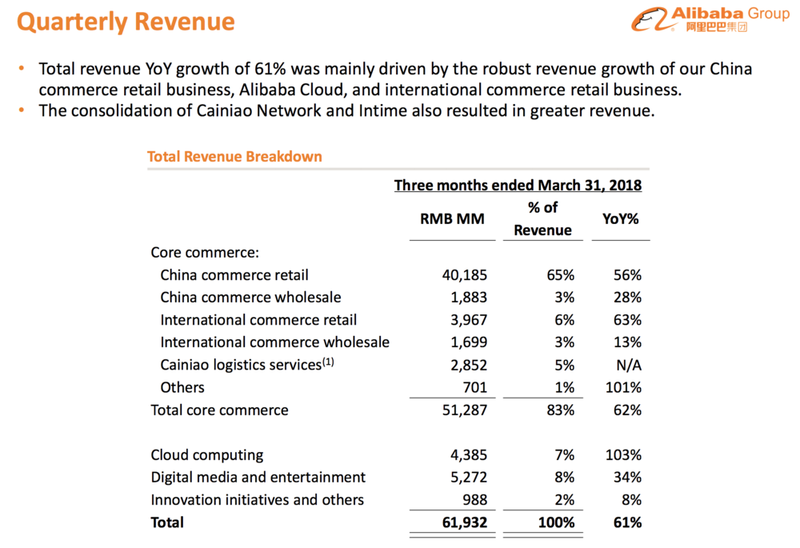 The strategy of Alibaba is very similar to that of Amazon, using the domestic cash flow and scale to fuel bets in content spend, international growth, cloud investments and the building of the largest domestic logistics network. 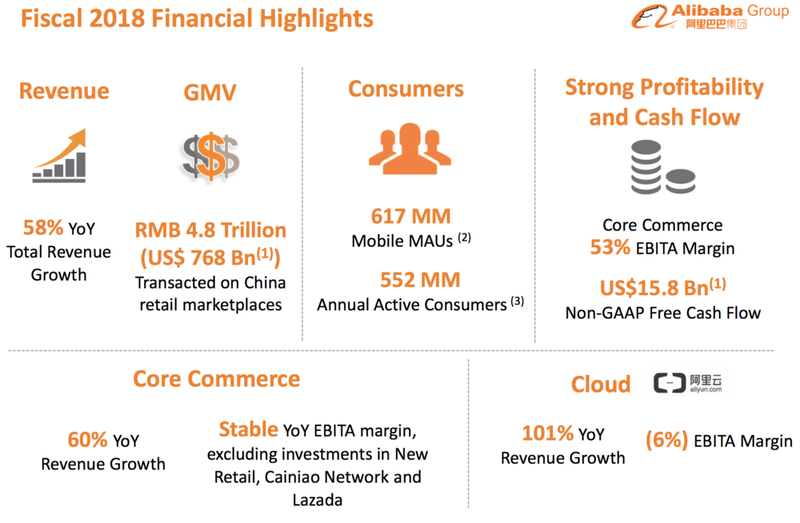 I remain convinced that Alibaba has rosier days ahead and is certainly the best way to play the Chinese market's maturation into a consumer led economy. Don't be fooled. The increase in cost of Prime is a calculated move by Amazon on the stickiness of the program. Amazon continues to use the cash flow from their Prime membership base and AWS growth to invest in their international expansion and offset the cost of logistics. This is one lever they know will likely see very little churn with a 20% increase. Bezos' #1 job these days is about effective capital allocation and this a well played move. Amazon's latest earnings provided the services inflection we have been watching. Amazon's ad network, mix of cloud services, Prime memberships and marketplace/3rd party seller services now account for nearly 40% of revenue. Add on the Whole Foods brick and mortar sales of ~8% and you have an etailer that only drives 53% of their revenue from the online store. Amazon continues to become the go to platform for selling, distributing and streaming everything from product to content. There is no slowing and profitability only improves as they become more of a service provider. Updated charts below. Best Buy & Amazon: Who Wins? A lot of chatter surrounding the Best Buy partnership with Amazon to begin selling Alexa powered televisions both on Amazon.com marketplace and within Best Buy stores. So who wins? Both. Let's take the easier one first. Amazon gains further reach into televisions for Alexa. Bezos wants Alexa everywhere. Amazon gains real world brick and mortar shelf space while also strengthening their online offering for televisions. A massive business for Amazon. Best Buy gains a technology platform for their private label Insignia televisions, additional customers via Amazon.com and more products to fill their stores in the pursuit of being the store selling EVERY brand. Keep in mind, Best Buy already sells Amazon products in stores alongside Samsung, HP and Apple store-in-store concepts. Keep in mind, Best Buy already sells on eBay. Product placement on marketplaces like Amazon and eBay is a must in today's ecommerce world. I am shocked it took this long. Most will call this a deal with the devil. I applaud both for seeking to exploit what each other needed. Is Dropship Amazon's Achilles Heel? Schiefelbein: How vulnerable is CommerceHub to the increasing centralization of ecommerce by giants like Amazon? Walker: Dropshipping penetration of ecommerce should grow as ecommerce players seek to compete with Amazon’s product assortment and cost and logistics advantages. Dropshipping can level the playing field with Amazon without the substantial infrastructure investments that company has made over many years. Long term customers of CommerceHub still only use dropshipping for 30-50% of their online sales. For many retailers dropshipping penetration is less than 10% of online sales. Given the benefits of dropshipping it seems logical that this penetration will increase over time. Every retailer I talk to these days is willing to start a dropship relationship (typically via CommerceHub) for literally any brand. It is easy to understand why. The retailer takes no inventory risk and allows for the buyer to quickly assess the brand's ability for success with a brick & mortar rollout. All the downsides are for the brand/manufacturer. The brand must ship a one piece order yet still only make wholesale on the shipment. This is why I believe dropship for retailers will never pan out to the industry's expectations. CommerceHub realizes this and is now focused on promoting their solutions for brands...extending a brand's reach to other platforms that aren't reliant on retailers...but reliant on marketplaces like Amazon, Facebook and Google. Dropship isn't Amazon's achilles heel. Dropship will further empower Amazon. Q4 is in the books. Earnings got off to a rough start with Walmart reporting ecommerce growth below the previous quarters 60% increases but picked up steam as department store mainstays surprised with positive comps. Commentary to be updated throughout the earnings season. Dillards - Margin showed a decent improvement and a positive comp of 3%. Their first positive comp in several years. Despite the optimism, I believe this is a case of all boats rise with the tide. Kohls - Absolute blowout of a quarter. Comp sales increase of 6% with strong margin improvement. That optimism became a bit muted once the 2018 forecast called for 0-2% increase in comp sales. Nordstrom - A positive 2.4% for full line stores in Q4 made the overall comp positive for the year. Guidance for 2018 is 0.5 to 1.5%. The next few quarters shall be interesting as Nordstrom continues to try and go private. Nordstrom Rack - A positive comp of 3.7% brought the full year to 2.5% and accelerated from the <1% comp of last quarter. TJ Maxx (Marmaxx) - The US arm of the TJX group posted a 3% positive comp. A reversal of the negative 1% posted last quarter and a match to the previous Q4. Canada now contributes $1b and Europe contributes $1.5b. as both are growing faster than the US (on a smaller base). One point of note, inventory year over year grew 16% vs. sales growing only 7% and forward guidance is only slightly up in comp sales.